Ladies, you know they say a saree is timeless. And we think the right saree can make or break your entire desi outfit. We went saree hunting in Kukatpally which came with the highest of recommendations from our moms, grandmoms, and you get the drift...basically everyone we rely on for a saree. So, come, hop on our shopping wagon! We often gawk at Teja Saree's Instagram page for major outfit goals. This designer outlet creates a wide range of sarees, lehengas, and fusion wear and is open to customisation as well. Taking orders both online and offline, it's usually swamped because of the unique collection it offers. Bright and funky sarees rub shoulders with Kanjeevaram Silk sarees. The colours are usually offbeat and it's tough to find those combinations in any other store. They also design saree blouses, and the price range depends on your choice and the detail of the work. Our favourite clothing emporium — Narsing — has an outlet in Kukatpally and like its main branch, this one is also full of affordable (And quality) fabrics. It has Kalamkari sarees in multiple patterns and colours that start at INR 650 and Benaras Silk sarees that are priced INR 1,100 upwards. Since the store also stocks up on readymade blouses (Priced at INR 500 onwards), you can just pick a saree and blouse. And lo and behold, your outfit is ready. Arguably the best in the vicinity for its silk sarees, The Chennai Shopping Mall is our constant. Whether you're the bride's sister or the bride herself, there have Kanjeevaram sarees in the most unconventional colours. Think of aqua blue and neon pink silk sarees and you shall get them here. The store neatly categorises sarees according to a certain price list, and you can just choose your budget and start shopping. Plus, they also have a decent collection of lehengas and fancy sarees. Adding cool to the old school, APCO (Or Andhra Pradesh State Handloom Weavers Cooperative Society) has stunning sarees. 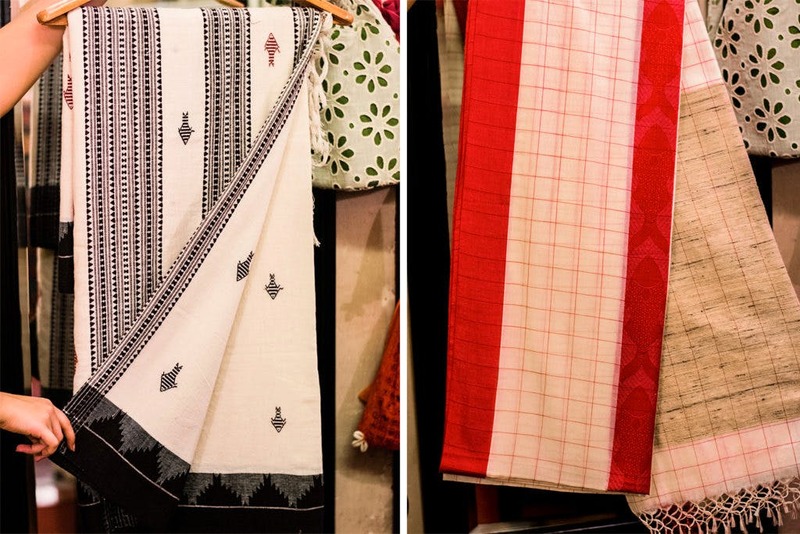 Take your pick from Venkatagiri, Mangalagiri, ikat, Gadwal, Sambalpuri sarees that are usually priced INR 1,100 and upwards. Of course, you'll find regular wear at cheaper prices that include kurtas, ikat dress materials. We found beautiful Madhavaram silk sarees with a peacock motif design and pink checkered sarees that are trending now. We totally dig the stuff here! Located in the bylanes of Kukatpally, this emporium is full of handloom pieces, kurtas, lehengas. With beautiful silk sarees as well as Pochampally cotton ones, this is known to attract women of all ages. Plus, the collection is quite vast and they have something for every budget. Looking for something fancy, bright, and indo-western? Kalakunj Saree Vatika located near Manjeera Mall is sure to attract you. The store has a wide range of chiffon and georgette sarees and it usually stocks up on the latest designs. For instance, it has pieces with elaborate temple design work as well as bridal ones with chariots, drums etc. The price range might appear a little higher, but for what it's worth, the quality is super neat.